Here’s post 4 of my Ventura Combat System progress. It’s hard to see from the picture above, but Lucina (long overdue shoutout to Fire Emblem by the way) is currently in the middle of her Turn Outcome. During this turn she had two Movement Maneuvers; the first being at M1 (coordinates 2×4) and the second at M2 (6×1). In the screenshot above, Lucina is moving towards M1. Once she reaches it, she will then move towards M2. The first step in building Maneuvers, probably the most important and time-consuming feature of this combat system, is to get a single person moving for both orders. On Day 4 I built the system to allow players to choose a Unit’s Tile Destination. Once that destination is chosen (by selecting it), a path is calculated from the Unit’s original position to that new destination. When confirmed, that Tile Destination is stored as M1 and completes the Unit’s first Maneuver. Maneuver 2 then involves selecting another tile to move to, but this time it’s from the M1 location. This was surprisingly hard to implement, and involved the storage of 3 locations based on the game’s state. Then her M1 location needs to be stored for path calculation towards M2. 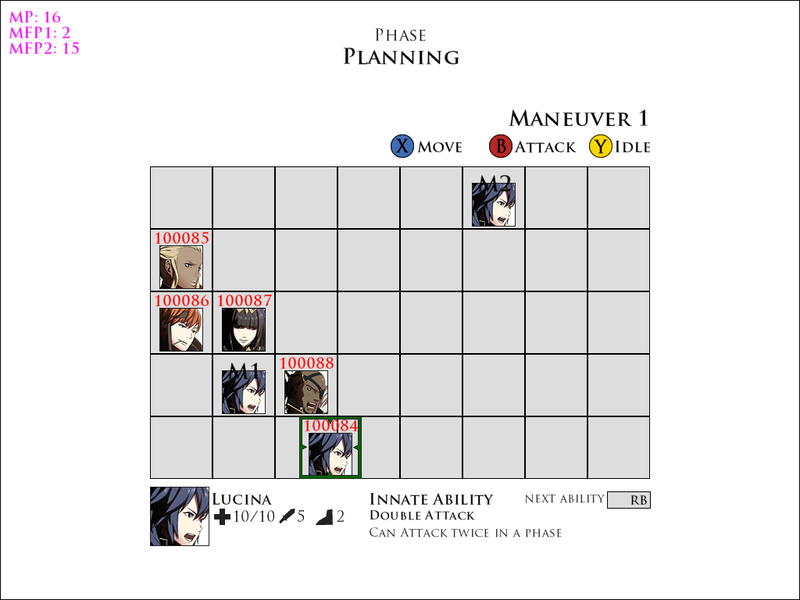 When the Turn Outcome happens, which ‘plays’ the two Maneuvers, Lucina’s Unit, starting from its actual position, has to move down those two paths sequentially. Finally her original location needs to be updated to M2 so the whole process can start again. I’m confused just reading this back… video would be a much better way to explain this damned diary! It’s coming soon, I swear. Simultaneous Turn Based Tactics provides some unique challenges that I haven’t seen dealt with in exactly the way I’m prototyping for Ventura. Challenge 2: The system is all about prediction and threat assessment, based on a unit area denial capabilities and the 3-way choice of Attack, Move, or Idle. Frozen Synapse is the game that originally inspired this idea, as I didn’t even know simultaneous turns was a thing until that wonderful game. 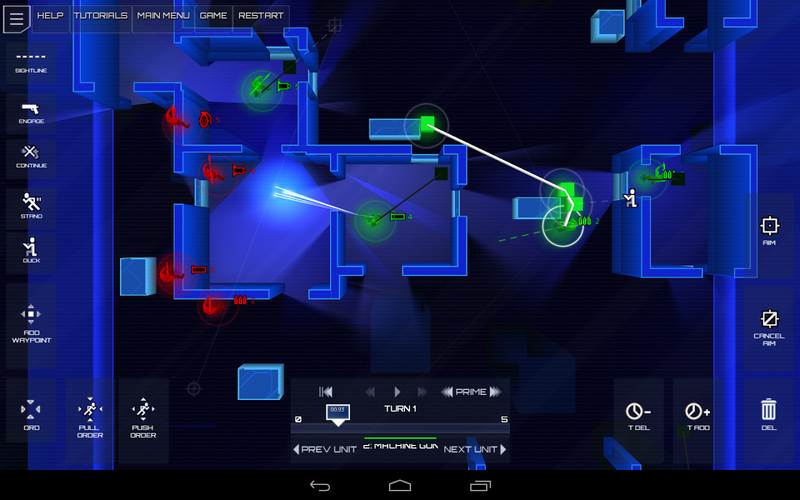 In Frozen Synapse, you and your opponent have a Time Window to set moves for. During this time, you can perform actions by delivering orders to your units. You can command them to move to waypoints, guard a certain direction, and choose whether they engage enemies or ignore them. It’s an extremely complex system with a lot of little mechanics. Much like in Ventura, you do not need to target specific enemies in Frozen Synapse. Units will attack on sight, and generally kill anything they see in one hit. In Frozen Synapse you have the Time Window to exploit during your turn. In Ventura, I’m giving the player two discrete ‘Maneuvers’ to exploit during their turn. During Frozen Synapse‘s Time Window you can give as many orders as you want to your units; you are only limited by the time it takes to perform each order. In Ventura you can choose to Attack, Move, or Idle for each unit, twice per turn. When the outcome begins, there is a particular order in which actions take place. Each of these steps is completed in full before moving to the next one. For example, if a Unit has set their first Maneuver to ‘Move’ but is already in range of an enemy ‘Attack’, they will be hit first before moving out of the way. Changing the order of these Maneuvers has a massive impact on the game, so I expect to make a few builds to experiment with what works best. Tomorrow we’ll be continuing Maneuvers; both the development (moving all your units) and design analysis (continuing the inspirations for the Combat System with XCOM: Enemy Unknown).